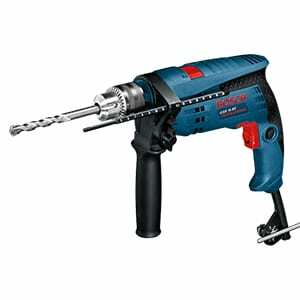 The Drill has an electronic control and right/left rotation and is therefore also suitable for screw driving and thread-cutting. The auxiliary handle can be set to any position for a secure and low-fatigue working posture. Turn the bottom part of the auxiliary handle in a counter-clockwise direction and swivel the auxiliary handle to the desired position. Then retighten the bottom part of the auxiliary handle by turning in a clockwise direction. The required drilling depth can be set with the depth stop. Turn the bottom part of the auxiliary handle in an anticlockwise direction and insert the depth stop. Pull out the depth stop until the distance between the tip of the drill bit and the tip of the depth stop correspond with the desired drilling depth. Afterwards, tighten the bottom part of the auxiliary handle again by turning in a clockwise direction. The knurled surface of the depth stop must face upward. The drill spindle is locked when the On/Off switch is not pressed. 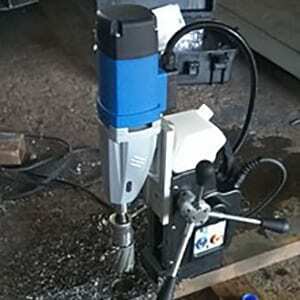 This makes quick, convenient and easy changing of the tool in the drill chuck possible. Open the keyless chuck by turning in rotation direction until the tool can be inserted. Insert the tool. Firmly tighten the collar of the keyless chuck by hand in rotation direction until the locking action (“click”) is no longer heard. This automatically locks the chuck. The locking is released again to remove the tool when the collar is turned in the opposite direction. Wear protective gloves when changing the tool. 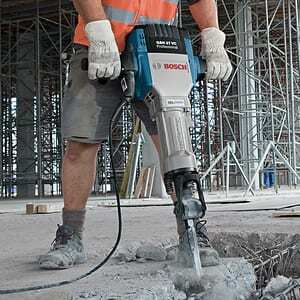 The drill chuck can become very hot during longer work periods. Open the key type drill chuck by turning until the tool can be inserted. Insert the tool. 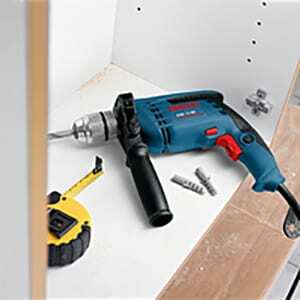 Insert the chuck key into the corresponding holes of the key type drill chuck and clamp the tool uniformly. When working with screwdriver bits, a universal bit holder should always be used. Use only screwdriver bits that fit the screw head. For driving screws, always position the “Drilling/Impact Drilling” selector switch to the “Drilling” symbol. Observe correct mains voltage! The voltage of the power source must agree with the voltage specified on the nameplate of the machine. 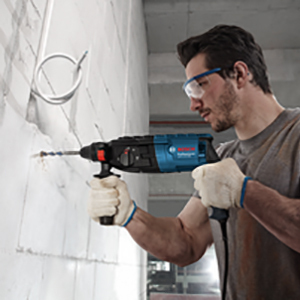 Power tools marked with 230 V can also be operated with 220 V.
Actuate the rotational direction switch only when the machine is at a standstill. The rotational direction switch is used to reverse the rotational direction of the machine. However, this is not possible with the On/Off switch actuated. Right Rotation: For drilling and driving in screws, push the rotational direction switch upward on the left side and at the same time downward on the right side. Left Rotation: For loosening and unscrewing screws and nuts, push the rotational direction switch downward on the left side and at the same time upward on the right side. Drilling and Screw driving: Set the selector switch to the “Drilling” symbol. Impact Drilling: Set the selector switch to the “Impact drilling” symbol. The selector switch engages noticeably and can also be actuated with the machine running. To start the machine, press the On/Off switch and keep it pressed. To lock the pressed On/Off switch, press the lock-on button. To switch off the machine, release the On/Off switch or when it is locked with the lock-on button, briefly press the On/Off switch and then release it. The speed/impact rate of the switched on power tool can be variably adjusted, depending on how far the On/Off switch is pressed. Light pressure on the On/Off switch results in low speed/impact rate. Further pressure on the switch increases the speed/impact rate. With the thumbwheel for speed pre-selection, the required speed/impact frequency can be preselected even during operation. The required speed/impact frequency depends on the material and the working conditions, and can be determined through practical testing. Use appropriate detectors to determine if utility lines are hidden in the work area or call the local utility company for assistance. Contact with electric lines can lead to fire and electric shock. Damaging a gas line can lead to an explosion. Penetrating a water line causes property damage or may cause an electric shock.